Nice to have more Abstract Gourmet content to read sir. Your mum will be stoked! Even if it was bad, that’s still pretty cool that your school served carbonara. Mine didn’t go beyond the limits of alfredo. Cheers Max, it’s nice to be back, if sloppily… May even try to sneak a few more posts in by the time the year is out. It appears that high school did to you what college did to me. Ham steaks with pineapple…? I had repressed that memory until now. Oh it can be much, much worse than cream or mushrooms. 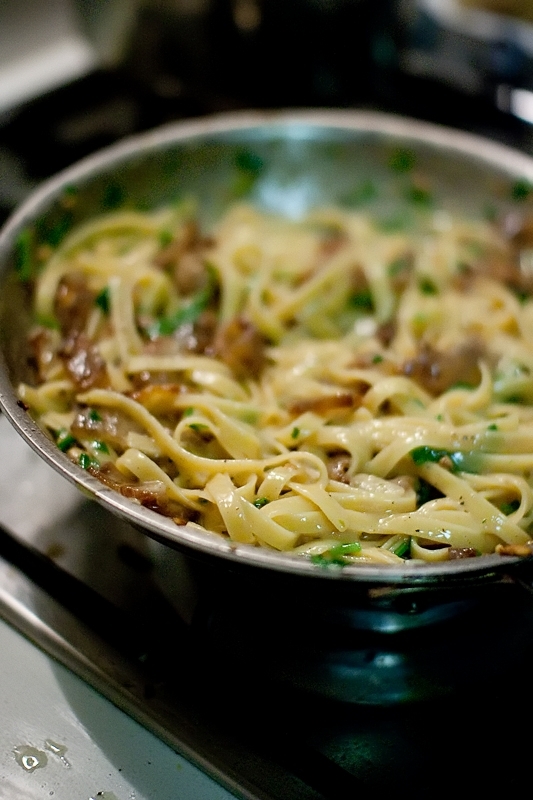 Ever heard of cream of mushroom soup used for “carbonara”? (I confess it can be a guilty pleasure, but it in no way is carbonara.) I use a recipe that has ricotta, but this is much more delicate (and look prettier on the plate too). Well done! I see your boarding school food and raise you English-Jewish food. 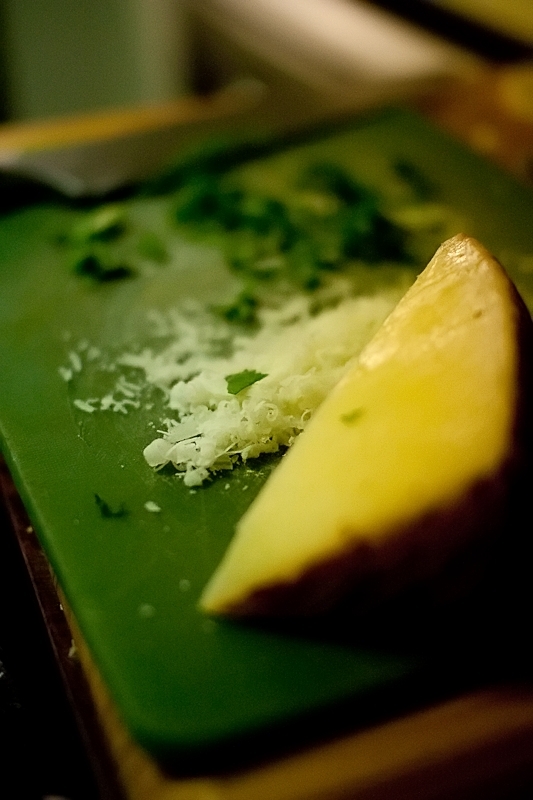 Sure, we get the desserts right, but if it isn’t grey, boiled, fried and then covered in salt it isn’t cooked. Mmmm YUMMO! Once I got over the idea that carbonora in itself is not bad for you – eggs + cheese + pig = good, I’ve been making it more and more. Sydneysiders – I have found Guanciale at AC butchery leichhardt. I have some in my freezer. No, you can’t have it. You’ll never change on the nugget thing, it simply isn’t do-able! Looks stunning as usual! I looked for guanciale for months and months and the only thing I found was the obscenely expensive Marchetti range available at the Boatshed in Cottesloe. No thanks. 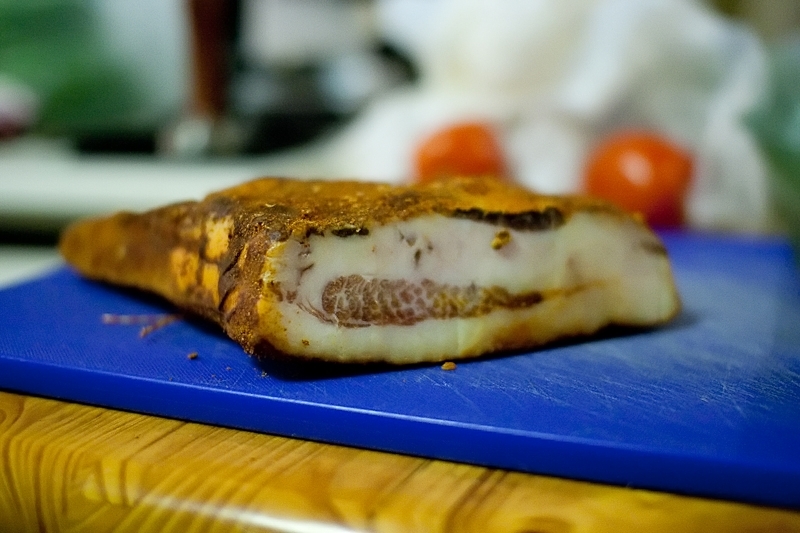 I found that flat pancetta that has been cured with plenty of chilli (Mondo Doro and Princi each do a good chilli pancetta) was the closest substitute, as you suggested. Good to see you back blogging again! Conor: UWA ruined me for plenty of other things. Namely chicken pies and mostly everything they served in the Ref. Fortunately I didn’t have to endure college life though, just my sisters Coles brand chicken schnitzel…shudder. Rachel: If I had a retail source for guanciale I’d have made this dish more than the 3 or 4 times it took me to get through my chunk of it. I can however see a market in illicit cured meats opening up that I might have to cash in on. And yes, you can keep your gefilte fish, I’ve had nightmares that were less scary looking than that. Charming Noodle Lady: You’ve used my exact method for working out what’s good for me by breaking it down into healthy components. Scientists will thank us in the future. Tenina: I’m waiting for McDonalds to bring out a range of gourmet chicken nuggets first, which will no doubt spur the nugget industry on towards gourmet greatness. Newly Melbourned Matt: I hadn’t checked the Boatshed for it actually, just the main old school butchers. I’m sure Vince could be convinced to make his own if he thought there was a buck in it. Yep, I’m sure he could! He’s an enterprising sort. He does sell pig jowls too, so he’d just need to cure them. 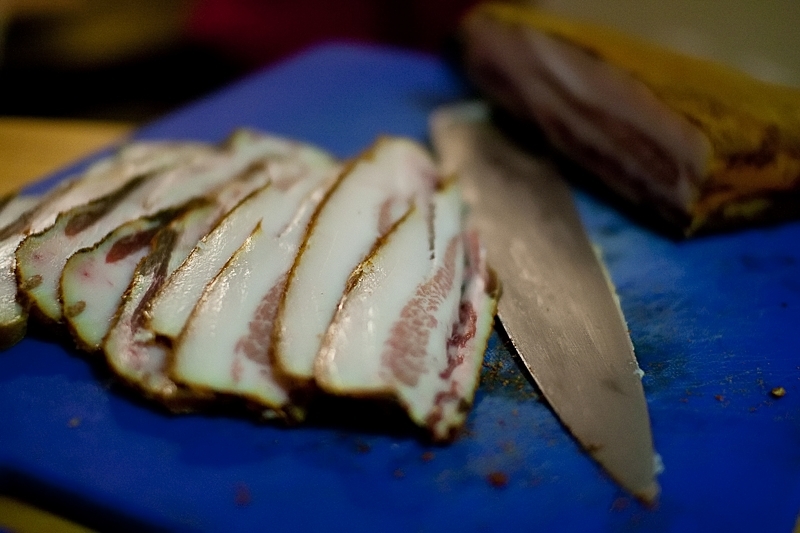 nice blog, i make my own guanciale each year, and agree that it is a fantastic well kept secret! you’ll find that normally the cheek meat is removed for a separate dish ( slow braise pork cheek )and that the jowl is the main part used for the guanciale. its actually quite easy to make yourself, and another of those products that i cant believe retails for such an ridiculous amount of money!!! If you’re Melbourne-based, you can get great Guanciale at a reasonable price from Leo Donati at Donati’s Fine Meats in Lygon Street, Carlton. Alison: Ixnay on the Elbournemay. You people and your convenient access to fancy small goods. It never ends. That is a SERIOUSLY good looking carbonara! Now if only I can find guanciale in Perth…! 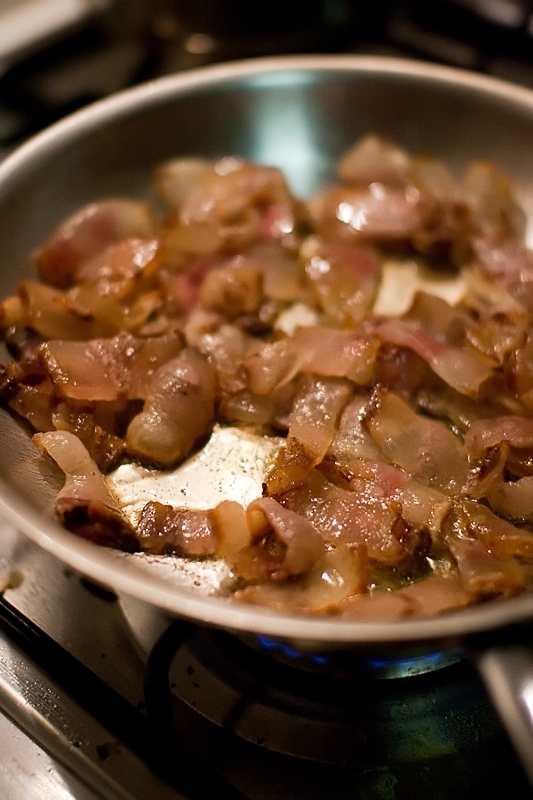 Its weird that no one sells or makes their own Guanciale in Australia. I’m sure no one would know what it was if the Italians didn’t introduce it to ya’ll. except for the dude you mentioned..and my family and probably some people out there that like guanciale. I wonder if I could import it from France? I would money. Yes, just as Italians wouldn’t have known about tomatoes if Columbus hadn’t brought them back from America. And Colombus could never have sailed to America if the Chinese hadn’t invented water. It’s a vicious circle. Ah, but who invented the circle? The Greeks, I bet. Authentic Carbonara contains neither garlic nor parsley and the pasta is strictly Rigatoni or Spaghetti not FettuccinE. But spot on with guanciale e pecorino. Where can you buy them in Perth? I was going to leave a comment but you inspired me to write a whole post! Laura: I knew someone would slip something like that in… Just as well I didn’t include the word “authentic” anywhere… Lets just pretend that the word “traditional” implies a hint of nostalgia without a strict adherence to anything, and we’ll all get along fine. And it would appear the answer to where to find guanciale in Perth is either nowhere, or make it yourself. Hey there! A new reader thanks to this recipe, and I posted my own take on it. Did you know your post is one of only two that come up on the first couple of pages of a Google search that DOESN’T use cream? Or mushrooms?! I’m appalled! 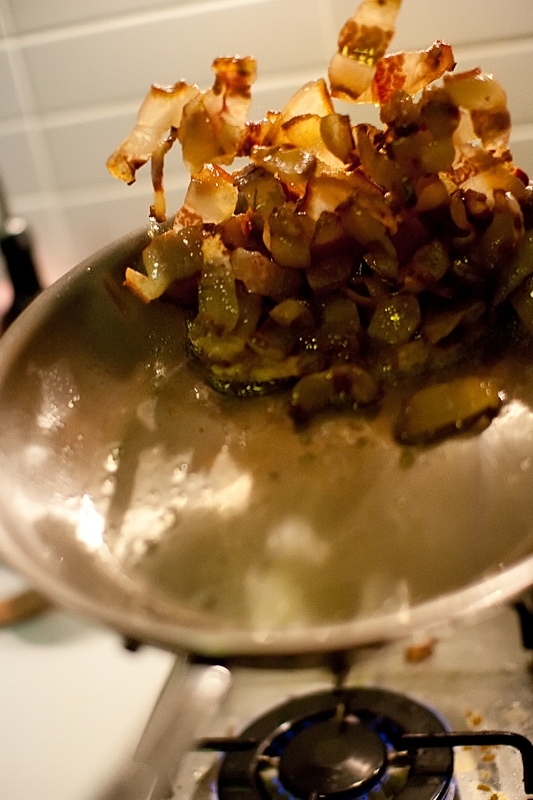 Anyway, thanks for posting such an awesome recipe. Your instructions are very easy to follow. And, thanks to you and the lack of proper Carbonara posts, I’ve decided to post my own as well. What can I say ? There are clearly a lot of poorly informed people on these internets. I’m just happy to do my bit to restore the balance, and any chance to correct the use of cream added to a dish is a personal win in my book.